As bike hotels are added to a number of Norwegian train stations, one of them is raising eyebrows for all the right reasons. Lillestrøm has on numerous occasions been deemed Norway’s best city for bicycle riders. Thus, it is fitting that two wheeled citizens now have access to a world class bike shed. Right next to the city train station lies an eye-catching box made of glass and wood, with enough room inside for 400 bikes. 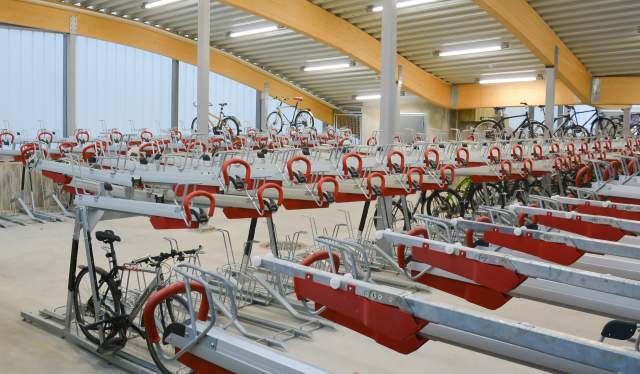 It is called the Lillestrøm Bicycle Hotel and is one of many bike hotels now popping up around the country as part of the Norwegian National Rail Administration’s plan for making it easier to commute to work and choose a bike/train-combination over cars. The task of shaping the bike hotel in Lillestrøm fell to Oslo-based Various Architects. According to architect Ibrahim Elhayawan, he and his colleagues found it vital to solve more than just the task of giving citizens somewhere to store their bikes. Elhayawan says that this is what inspired the building’s dynamic shape and style. Seen from the outside (especially at night), a warm glow of light is filtered through the glass walls, whilst a staircase invites both travellers and locals up on a wooden roof where they can enjoy a view of the city from wooden benches. There is even a green area up there. Tiny gaps between the panes of glass allow for natural air ventilation, and during daytime the building is lit by natural light filtering through the glass, keeping its carbon footprint small. The bicycle hotel opened in October, and now, international magazines like Wired have caught on. They call it “a serious – and seriously useful – piece of urban infrastructure”, whilst Digital Trends says that “Norway demonstrates an elegant solution” when it comes to cutting down on greenhouse gasses and reducing traffic. Should you be in need of a place to store your bike whilst in Norway, gaining access to a bike hotel is relatively easy. Send an SMS to +47 2300 with SYKKEL <STATION NAME> and you will receive a text back with a phone number you can call to open the door to your bike hotel of choice. The price is NOK 50 for a month of access, although additional fees may apply for international visitors depending on your service carrier. Apart from Lillestrøm, you can also find bike hotels in Drammen, Gulskogen, Sandefjord, Moss and Asker, with more being added in the future. Almost 50K people are following his updates on Instagram. After 12 000 kilometres cycling through most of Europe, the 23 year-old has finally arrived in Norway.